Green: Offer up your seat or send a positive text. Amber: Use your phone to be generous. Give online to a cause. Encourage some friends on a messaging app. Get on your Stewardship account, and put aside generosity money. Red: Pray. All day. Whenever you can. Even when you’re hurting, or needing a break, focus on others. It sounds easy, but it’s not. In November 2017 I had just come back from a national church weekend away convinced that God was about to call me to face something big and exciting. He was. A week later, I was diagnosed with breast cancer. I have followed 40acts for about three years now and blogged about my failures and my little successes. 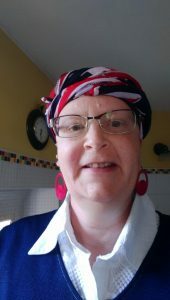 By the time Lent rolled around in 2018 I had already had my lumpectomy and chemotherapy was about to begin. ‘Why should I get involved this year?’ I thought. The opening sentences of the first act reminded me why: In the most extraordinary act of generosity the world will ever know, God offered His son, Jesus, as a gift to all. We need only say thank you. God is good. God is loving. I believed that before my cancer diagnosis. I believed it no less after it. But how could I repay that generosity to others in my situation – going back and forth to hospital, spending a week in bed and two weeks feeling fairly lousy again before the next chemo appointment rolled round? In a beautiful coincidence, God had given me the verse from Isaiah that you see above. This verse was – and still is – my touchstone. He used this verse throughout my treatment to remind me that he is always there, to hold my hand when I reach for him. And to help me to be generous. Through 40acts 2018 I learned that being generous is possible even when debilitated. I realised that generosity is a conscious act of focusing on others, rather than myself. I couldn’t always follow the acts themselves, but I could still be generous. I recognised that even the smallest things could make a difference – not complaining to the district nurses who found it unbelievably difficult to get any blood out of my veins each week was an act of generosity in my book! Holding others up to God, even just repeating their names while dropping off to sleep, was sometimes all I could manage, but I knew that he would honour my intentions. Just as he will yours, this year. Do not fear: he will help you. Alison has lived in a small village in central France since 2005. An independent English teacher, she is also a Licenced Lay Minister, worshipping with the Episcopal Church in Clermont Ferrand. She has followed 40acts for four years and tries to follow the idea that ‘40acts is not just for Lent’. Married, with four cats, she enjoys reading, zentangling and blogging.